Historic moment for the rail industry as GB Railfreight names the last-ever-built Class 66 locomotive “Evening Star” at an event at the NRM, York. 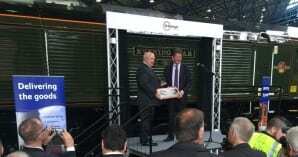 During a ceremony at the National Railway Museum in York on May 10, GB Railfreight (GBRf) unveiled the name and livery of locomotive 66779, the last Class 66 to be built for the UK and European markets. GBRf has named locomotive 66779 Evening Star and it has been liveried in lined passenger express ‘brunswick green’, in commemoration of the last steam locomotive of the same name to have been built by Swindon Works for British Railways in 1960. This is an historic moment for the industry. The Class 66s have made a major contribution to UK rail freight, transforming reliability since their introduction in 1998. In recognition of these achievements, GBRf has promised to donate 66779 to the National Railway Museum National Heritage Committee at the end of its working life, to be preserved for the benefit of the public. The event was also a celebration of 15 years of operations for GBRf. Starting off with just two employees and an infrastructure contract with Railtrack in 2001, the freight operator now employs over 650 staff, operates over 1,000 train loads each week for clients across the energy, aggregates, intermodal and infrastructure markets, and generates annual turnover in excess of £130 million. The freight operator was joined by over 200 guests from across industry, government and the media for the ceremony. GBRf Managing Director John Smith and Progress Rail Services and Electro-Motive Diesel (EMD) CEO Billy Ainsworth delivered speeches before 66779 was unveiled. 66779 is the last of seven locomotives (66773 – 66779) that were procured from EMD and that arrived in the UK in February of this year. In addition to the 21 Class 66s that arrived in the UK last year, they bring the operator’s Class 66 fleet to 78 locomotives. Given their heavy freight capabilities, the 28 locomotives will be used to support operations across various GBRf market portfolios. John Smith, GBRf’s MD, said: “This is a hugely historic moment for the rail industry. The Class 66 locomotive is probably the most successful design to ever run on Britain’s railways, and we have decided to honour their achievements by naming the last 66 to be built after British Rail’s classic 92220 ‘Evening Star’. “As a life-long railway man, it makes me immensely proud that my company has the opportunity to own the last 66 off the production line for use on our operations across the country. In recognition of the achievement of this locomotive, we will be donating 66779 to the national collection at the NRM at the end of its working life, so it can join 92220 and be preserved for the enjoyment of everybody. “Today also marks 15 years of operations at GBRf. It was not long ago that we started out on our first infrastructure contract with Railtrack and we’re now operating over 1,000 train loads a week. We could not have got here without the hard work of GBRf employees, past and present, and I would like to take the opportunity on this special day to thank all of those that have given so much to GBRf along the way.